The ARCHT One wireless speaker epitomizes ingenious audio technology wrapped in a sleek modern design. At first glance, you're not sure what to think of this sculptural speaker that germinated from a successful Kickstarter campaign and is now available to the public. When you turn it on and listen to its rich clean sound, it quickly becomes clear that this Art Deco inspired totem is a premium speaker that can fill a medium-sized room with full-bodied audio. Beyond its luscious audio quality, the ARCHT One offers the wireless connections that you would expect from such a contemporary design. Through its integrated WiFi adapter, you can set up the speaker to connect to Apple devices through AirPlay or to DNLA compatible devices through that protocol. Or if you have a Bluetooth enabled computer, tablet or phone, you can connect to the ARCHT One wirelessly within about a 30 foot range. This speaker offers only one wired connection. If you have legacy, non-wireless sources like a TV, you can attach an analog audio cable to the ARCHT One's mini-jack stereo audio input. It does not provide an HDMI or a digital audio input. If you are wondering if this solo speaker would be appropriate for a TV setup, the simple answer is yes. Substituting the One for the often woefully inadequate speakers built-in to many TVs would be a major improvement. But even though ARCHT states that their "patented Sound Array transforms speakers from directional to multidirectional" you simply can't recreate a true 5.1 surround sound from their solo speaker. With that said, the ARCHT One could serve as an excellent all-in-one multitasking speaker handling wireless playback from phones and such and wired playback from your TV. One last point, the ARCHT One is light enough to be portable, but unlike some of the new wireless speakers, it does not include a rechargeable battery. It needs to be plugged into to an electrical outlet. 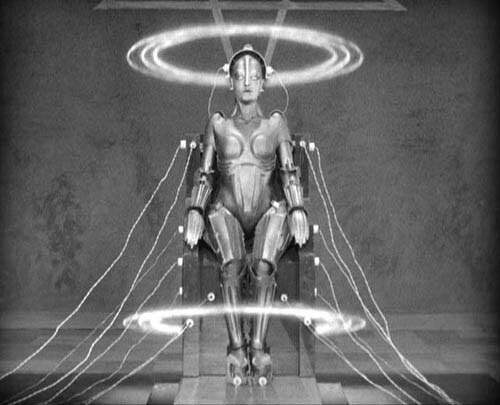 I imagine the ARCHT One as the offspring of the Maschinenmensch robot in the classic German Expressionist movie Metropolis. The unit weighs 8 pounds, stands a little over 17 inches high and is about 7.26 inches wide at its base and curving to about three inches near its crest. 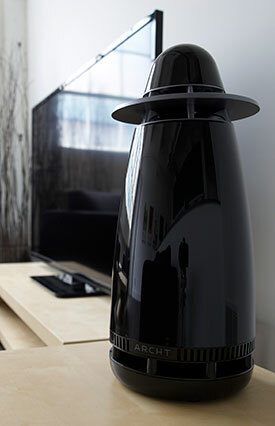 The cone design with its gloss black finish is visually pleasing as well as acoustically inventive. The full range speaker and subwoofer face each other and the orientation disperses a "Sound Array" out all sides of the opening near the top of the speaker. 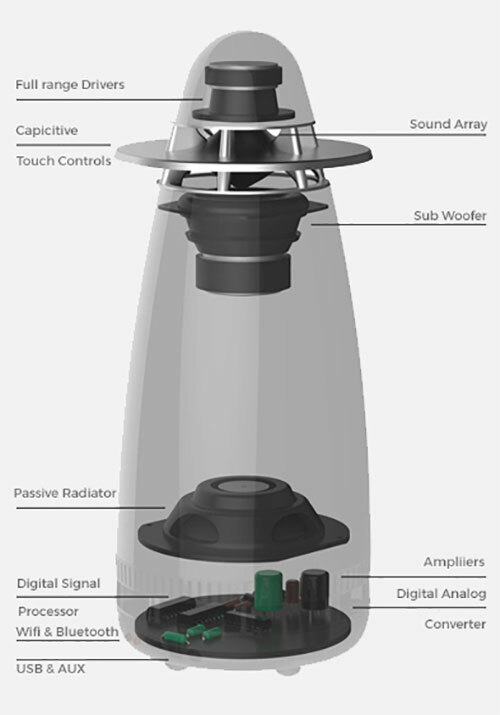 On the top, the full range speaker's diameter is 3.15 inches (80mm) and has a frequency response of 52hz - 20Khz (+/-3dB). Below it, the woofer's diameter is 4.72 inches (120mm) and has a frequency response of 35hz - 20Khz (+/-10dB). The max output is rated at 100dB (dB SPL). Near the bottom are the USB, Aux (analog audio minijack) and power cord inputs. Next to them are WiFi and Bluetooth buttons used in setting up the ARCHT One. On the other side of the bottom are four LED lights that indicate which input is selected. Near the top, the intersecting brushed metallic disc provides four capacitive touch controls, Volume (+ and -), Input Selection, and Play (Pause). The ARCHT One package does not include a remote control. Perhaps since the product is just being released, there is not a wealth of documentation available. The Quick Start Guide is minimal and the Help screen on its iPhone app is empty. Luckily the basic operation of the ARCHT One is fairly straightforward and the initial setup only involves a few steps. The Quick Start Guide walks you through the four options setup options: Airplay, Bluetooth, USB and Auxillary (the analog audio connection). I'll admit that the first time I tried the Airplay process, I was unsuccessful in establishing a connection between my iPhone and the speaker. After resetting the ARCHT One, all was copacetic. I even discovered that iTunes on my PC recognized the speaker through Airplay and I could playback music from my hard drive wirelessly on the ARCHT One. I was also able to establish a Bluetooth connection from the speaker to the computer. The ARCHT One app on the iPhone includes a Dynamic Room Optimization feature (pictured on the right), which "optimizes ARCHT One's sound based on the space in which it is being used." The procedure entails pressing one button and letting the Optimizer go to work for about a half minute. Easy peasy. 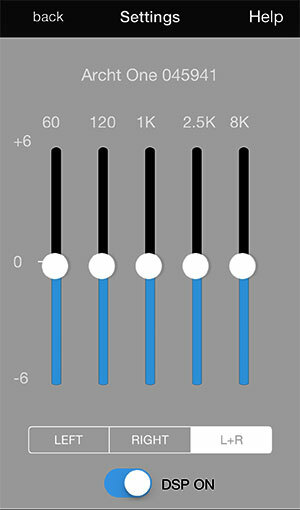 The app also includes a five band equalizer if you wish to fine tune the speaker. At the bottom of the Equalizer screen, you will notice a menu where you can select Left, Right or L+R. I wondered why you would have those options for a single speaker and technical support at ARCHT One stated, "The default for a single ARCHT One is the L+R channel. When a user connects 2 to 6 speakers, each unit can be configured to Left or Right channel for stereo imaging with surround sound." The ARCHT website does state that the WiFi connection allows for 24kb/192kHZ streaming and that with WiFi Multizone up to six units can be connected via Airplay. In addition, up to two units can be paired via Bluetooth. Remember, a Bluetooth signal has a range of up to 30 feet. As for the DSP button, tech support replied, "The DSP button is ARCHT One's Digital Signal Processing. It simply creates a dynamic audio quality independent of the source where you will hear the differences distinctively. The audio will be crisp with clear sub bass." And suggested, "Try it with a few 16/48khz sources and you can hear the difference." Finally, the ARCHT One rep added, "There are quite a few major enhancements made to the app such as volume control and better Bluetooth pairing." Many speakers that are built-in to today's TVs sound too "tinny" for my ears. Others are too bright, which appeals to some folks. The problem with these speakers are twofold. First, as TVs have become thinner, the space for the speakers to reverberate has become squeezed and the units squeak instead of roar. Also many TVs do not include an integrated subwoofer, therefore the lower register of the scale is underserved. 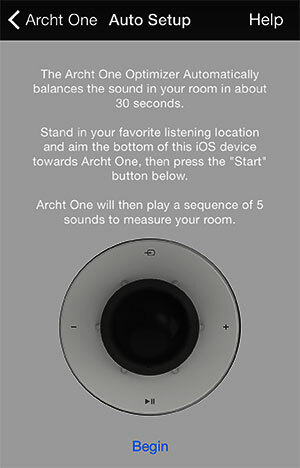 The ARCHT One solves both of those issues by giving its drivers room to breathe and supplying a well-balanced subwoofer. The result is a full bodied, velvety output. Now, one of the ARCHT One's selling points is its "Immersive Multidirectional Sound" and it is in fact quite captivating. The question is, with only one speaker, are you going to miss the binaural effect that you receive from stereo playing back from a pair of speakers or your headphones. For me, the answer is no. Of course, if I'm watching an action movie, then I definitely prefer a full 5.1 or better surround system. Then again, I reckon that is not the content nor the competition for ARCHT One. 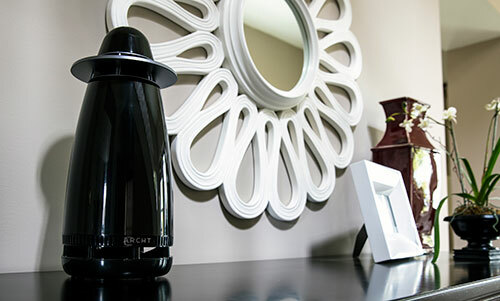 As a wireless, all-in-one speaker playing back music, the ARCHT One performs as well as it looks and that's strikingly. At a retail price of $600, the ARCHT One is not exactly a bargain even if it is an all-in-one wireless speaker. In this extremely competitive audio marketplace, you should be able to find a number of well-performing wireless speakers at or below this price point. But few, if any, are as aesthetically captivating as the ARCHT One's conic and iconic design. And to me, the visual splendor of a speaker is valuable. Add that to the speaker's splendid audio quality and its ability to multitask as a wireless player of music and a wired speaker for a TV and the ARCHT One could be a candidate for an audiophile who wants his speaker to look as great as it sounds. The ARCHT One all-in-one wireless speaker sports a design that is not only good looking but also is the keystone for producing a truly engaging multidirectional sound field.